Sri Lanka, the 'Teardrop of India', is a collection of ancient and natural delights that will bedazzle visitors as you move from religious to monarchical to colonial sites. Left behind by Buddhism, Hinduism, the British, Dutch, Portuguese, and Indians these influences are seen throughout our trail of historical and cultural sites. We visit five of Sri Lanka's eight UNESCO World Heritage sites as we cycle through the backroads and absorb a very traditional and grassroots feel of Sri Lanka. Our ride start by rolling into the beautiful old town of Kandy, home to the famed Temple of the Tooth and located on a picturesque lake. We next head into open abundant countryside, riding towards the caves and statues of Dambulla's Golden Temple. The dominating rock fortress of Sigiriya will be in view most of our ride as we cycle towards it. After a climb to the top we walk through one of the oldest landscaped gardens in the world. At Minneriya National Park, we will find plenty of elephants on our jeep safari. The next fascinating stop on this trail of Sri Lanka’s most ancient cities, Polonnaruwa, is an immense former capital created in the 12th century. Hidden in dense jungle for many years, Anuradhapura, our last heritage site is a treat: with palaces, monasteries and monuments and a principal shrine of Buddhism. Welcome to Sri Lanka! We meet your flight and transfer to our accommodation in Negombo for a welcome dinner. We transfer to fertile Mawanella to start our ride through coconut and rubber plantations. We climb up to and through the Balana Gap then ride down to the Royal Botanical Gardens for a short break. We end our day in the beautiful UNESCO World Heritage town of Kandy, home to the Temple of the Tooth. The Golden Temple of Dambulla, our second UNESCO Heritage site, is our destination today. This famous rock temple dates to the 1st century BC, and we explore the caves that sheltered King Walagamba during his 14 years of exile. We pedal out of Dambulla and to the unique ancient 5th century rock fortress of Sigiriya (Lion Rock). We ride along the shores of Kandalama Lake with great views of Sigiriya, another UNESCO World Heritage site. We overnight in Polonnaruwa. We head to Minneriya National Park for a jeep safari. The park is the habitat of wild elephants, which we may see. We cycle back to Polonnaruwa on a smooth tree-lined road through a forest reserve. We explore our fourth UNESCO World Heritage Site, Polonnaruwa, the 10th century capital. After a transfer, we ride to Anuradhapura, one of the oldest continuously inhabited cities in the world. Considered sacred to Buddhists, we'll see the Bo Tree said to have grown from a branch of the tree under which the Buddha gained enlightenment. After breakfast, transfer to Colombo for onward travels. Day 2 - Negombo - Kandy Ride 42km. +806m / -479m. Tour was very enjoyable and we were very fortunate to only have 4 guests so it felt very personal. The cycling was good and varied and distances were fine. Chemara was very informative about the wildlife, particularly bird spotting. Great biking experience with excellent guides to ensure the satisfaction and safety of riders. One of the best holidays I've had, this was a great combination of cycling and site seeing. In particular the guides were all helpful and supportive. They went above and beyond to make sure we had a safe and enjoyable ride. Such an amazing way to see a country! Our bicycle journey will be on quiet back roads, estate tracks, and gravel paths. We cover 222 km in 5 cycling days, and much, if not most, of the terrain is undulating. When you combine the great variety of cycling with the cultural and natural attractions, there is plenty to delve into and enjoy. Suitability: This trip is an active tour, which means you can expect to exert yourself on some sections of the ride. Cyclists should be in relatively overall good physical shape with at least a moderate degree of cycling experience. Being physically fit will, of course, be a huge asset, but as the tour is fully supported, the van is always close at hand if needed. Biking Conditions: The road surfaces are mixed: most days, we ride on reasonably good quality asphalt roads, but there are enough sections on very badly broken or dirt tracks that you will need a mountain bike, preferably one with front shocks. However, there is nothing technical involved on this tour, and anyone, assuming they have a reasonable level of fitness, will be able to join. A support truck is always available to help. We will meet you at Bandaranayake International Airport upon your flight arrival and transfer you to our nearby hotel in Negombo for a welcome dinner. We depart in the early morning and transfer from Negombo to fertile Mawanella. Our ride begins amidst coconut and rubber plantations and skirts rice paddy fields and local villages. After a gentle warm-up, it's time to start climbing up to and through the Balana Gap. We then ride down to the Royal Botanical Gardens where we take a break to see some of the more than 4,000 species of plants. It's then a short ride onto the beautiful UNESCO World Heritage town of Kandy, one of Sri Lanka's most sacred destinations. Surrounded by mountain ranges and built around a lake, Kandy is home to the Temple of the Tooth, where a sacred tooth relic of Lord Buddha has been enshrined since the 4th century AD. After breakfast we have a short transfer to the town of Matale, known for its cultivation of spices. Here we start riding towards Dambulla using a mix of tarmac and red dirt roads. Our scenery will again be dominated by bright fruit orchards, rice paddy fields, and the huge elephant grass that grows wild. Our destination is the Golden Temple of Dambulla, a UNESCO Heritage site. This famous rock temple dates back to the first century BC, and we explore the caves that sheltered King Walagamba during his 14 years of exile from Anuradhapura. Once he regained the throne, he built some of the most magnificent rock temples to be found on the Island. We finish at our hotel where there'll be time for a swim before dinner. Our tour pedals out of Dambulla and proceeds to the unique ancient 5th century rock fortress of Sigiriya (Lion Rock). As we ride along the shores of Kandalama Lake, we’ll get excellent views of Sigiriya, another UNESCO World Heritage site. We park our bikes and climb up to the abandoned royal palace, converted to a Buddhist monastery. On our way up, we pass famous frescoes and mirror wall. The views from the top are fantastic and more than worth the effort. 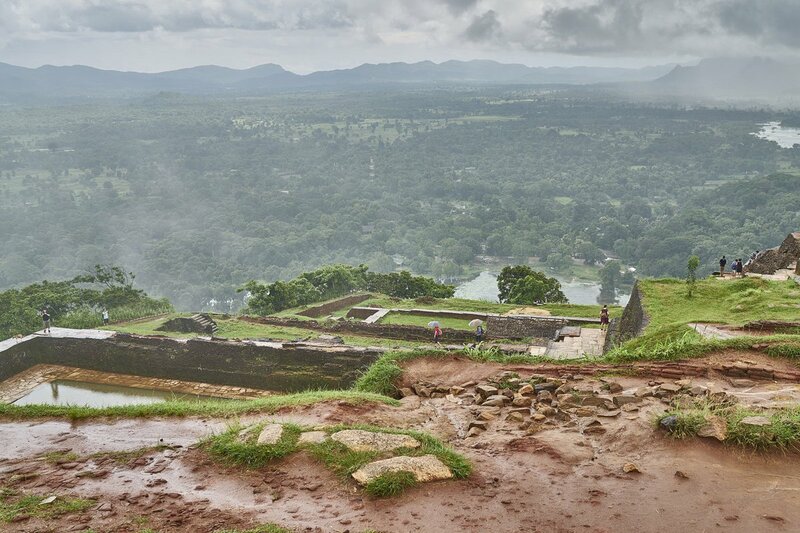 Once we have explored Sigiriya thoroughly, we'll have a short transfer to our hotel in Polonnaruwa. An early morning jeep safari awaits as we head to Minneriya National Park to hopefully find some wild elephants. This morning is the chance to see some signature wildlife of Sri Lanka in an uninhabited wilderness environment. The park is the habitat for wild elephants, buffaloes, boar, spotted deer, sloth bear, sambhur leopards, crocodiles, jackals also varieties of butterflies. Our morning safari ends with a snack, and then it's time to mount the bicycles again. We cycle back to Polonnaruwa on a smooth tree-lined road through a forest reserve. When we reach the Polonnaruwa Tank, a very large man-made lake, we have lunch and relax as we still have a busy afternoon ahead of us. We next explore our fourth UNESCO Heritage site, Polonnaruwa, the 10th century capital and best preserved of Sri Lanka's ancient cities. We start the day with a drive of about 2 hours, so we can ride through the ruins of Anuradhapura, the most celebrated of Sri Lanka’s ancient cities. It is one of the oldest continuously inhabited cities in the world. 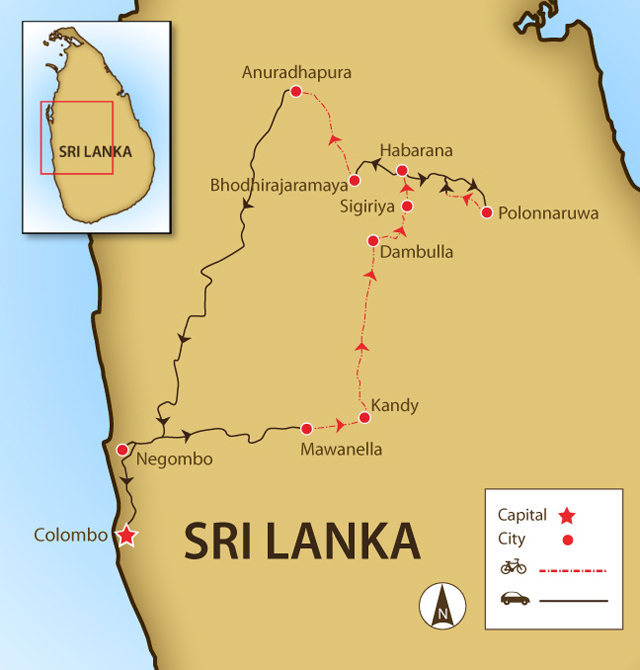 From the 4th century BC, it was the capital of the Sinhalese until the beginning of the 11th century AD. During this period, it remained one of the most stable and durable centres of political power and urban life in South Asia. Considered sacred to Buddhists, we'll see the Bodhi-Tree said to have grown from a branch of the tree under which the Buddha gained enlightenment. The riding will be flat and interesting, and you have a cool down in the hotel pool to look forward to after our day of cycling. After breakfast, we transfer you to Colombo for your flight onwards or trip extension to Galle. Included in this tour are well-known makes of hybrid or mountain bikes with lightweight alloy frames, 24- to 27-speed gearing, v-brakes, and Shimano components and front suspension. We also have E-Bikes available for hire. They are of SCOTT brand and come in 2 models with alloy frames, 9-11 speed, Shimano disc brakes, and components. Please ensure your passport is valid for at least 6 months from the date of entry. You must obtain a US$35 visa (US$20 for SAARC countries and no charge for children under 12) via the ElectronicTravel Authorization (ETA) system before entering the country. If you don't obtain a Visa Approved Reference number through ETA you can obtain a visa on arrival for US$40. We recommend that you visit a travel medical doctor and ask about vaccines and /or antimalarial tablets. This is also a good opportunity to discuss important travel health issues including safe food and water, accidents, sun exposure and insect bites as the problems experienced cannot be prevented by vaccinations and other preventive measures need to be taken. Sri Lanka has a tropical climate, with distinct dry and wet seasons. The seasons are slightly complicated by having two monsoons. From May to August the Yala monsoon brings rain to the island’s southwestern half and the Maha monsoon blows from October to January, bringing rain to the North and East. There is also an inter-monsoonal period in October and November when rain can occur in many parts of the island. Average temperatures for Colombo and the low-lying coastal regions are 27°C while at the higher altitudes like Kandy (500m), the average temperature is 20°C. A gortex rain jacket and a warm jumper for the central highlands are suggested clothing. The best months to visit Sri Lanka are from December to March for the west coast, and from April to September for historical sites and the east coast. As we are traveling the length of the country it is likely for us to experience rain, however, it will be warm and we will likely continue riding through it. The hotels listed are our first choice and where we hope you will stay, however, during festivals or other major events there is a chance we will have to substitute another hotel. Meals are included as per the itinerary where B = breakfast, L = lunch, D = dinner. Most meals are local and feature rice and curries. Sri Lankan curries come in many varieties of colors and flavors and can be meat- or fish- based dishes, but there are also vegetable and even fruit curries. Many of the spices used have ayurvedic value when used in curries. Meals are a mixture of local and western cuisines, with the local key ingredients being rice, coconut and especially spices, reflecting the island's history as a spice producer and trading center for hundreds of years. Any special dietary requirements can also be catered for as well. Please let us know at the time of booking. Keeping you completely hydrated is a job we take very seriously. Cold water, some energy-restoring local fruit, and soft drinks are included in the tour price while riding. Soft drinks and other beverages during meals are not included. Beer is readily available everywhere but is NOT included in the price. We recommend that you tuck away a few extra dollars, perhaps US$10 a day for incidentals. The Sri Lankan currency is the rupee (Rs). There are several money changers in the capital as well as major tourist cities and attractions. They generally don’t charge commission and their rates are pretty good, with unlicensed money changers giving slightly better rates than officially licensed ones. However, ATMs are recommended if you are unsure and afraid of getting ripped off. ATMs have spread to all of the cities and major regional centers of Sri Lanka with Commercial Bank having the largest network of ATMs accepting international Visa, MasterCard, and Cirrus/Maestro cards. Any bank or exchange bureau will change major currencies into cash, including US dollars, euros and pounds sterling. To get the best rates, change rupees back into hard currency before you leave the country.